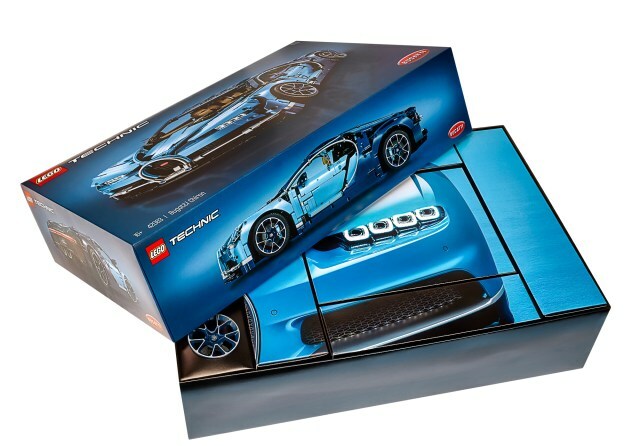 LEGO’s own Bugatti Chiron set, previewed here at The Lego Car Blog earlier in the year, is due later in 2018. 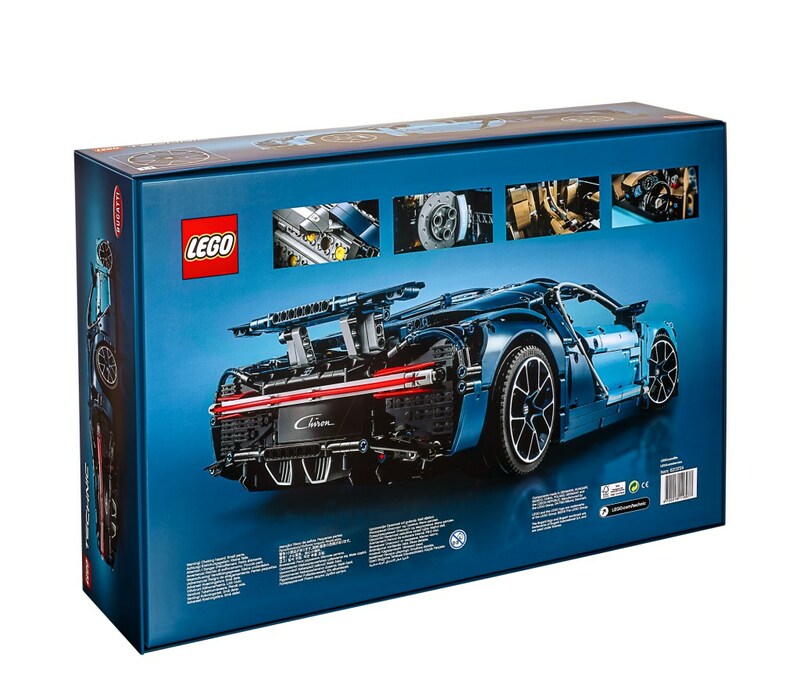 However one builder has beaten LEGO to it, and in doing so may have set the bar not just higher than LEGO themselves could hope to achieve, but possibly higher than any Technic supercar has done to date. 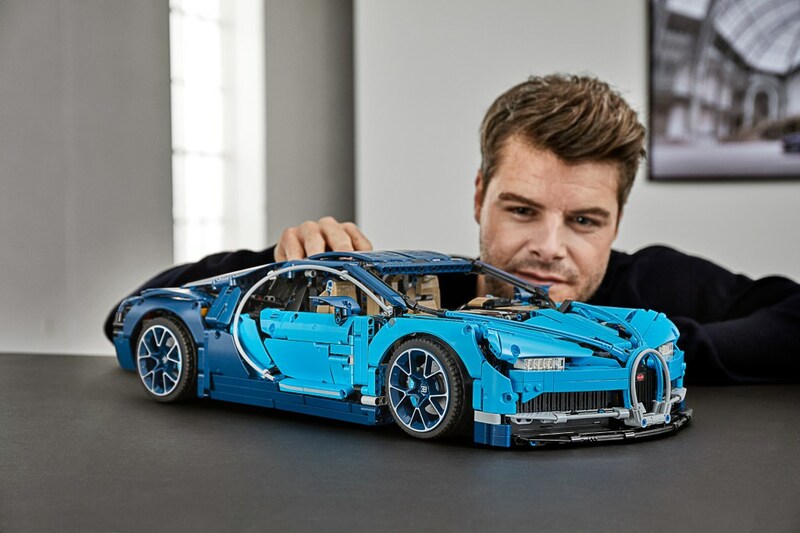 This is Leviathan‘s 4,000-piece, 3.7KG, two year in the making 1:8 Technic Bugatti Chiron supercar. 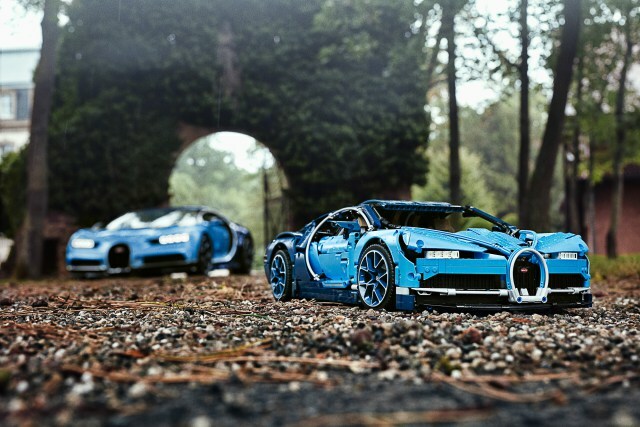 Designed as a modular construction, as per a real car, Leviathan’s Bugatti Chiron features Power Functions remote control operated via a third-party BuWizz bluetooth brick, a seven speed dual-clutch gearbox, all-wheel-drive, working steering with Ackermann geometry, electronically height adjustable independent suspension, a replicated W16 engine, and even active aerodynamics. Five Power Functions motors are controlled by the BuWizz bluetooth brick, with two RC motors driving all four wheels, an XL motor powering the seven-speed dual clutch gearbox, and a fourth motor powering the steering. The fifth motor uses a gearbox to switch between two functions; raising/lowering the suspension, and controlling the three-position rear spoiler/air-brake (shown in the picture above in air-brake mode and in the image below fully retracted). 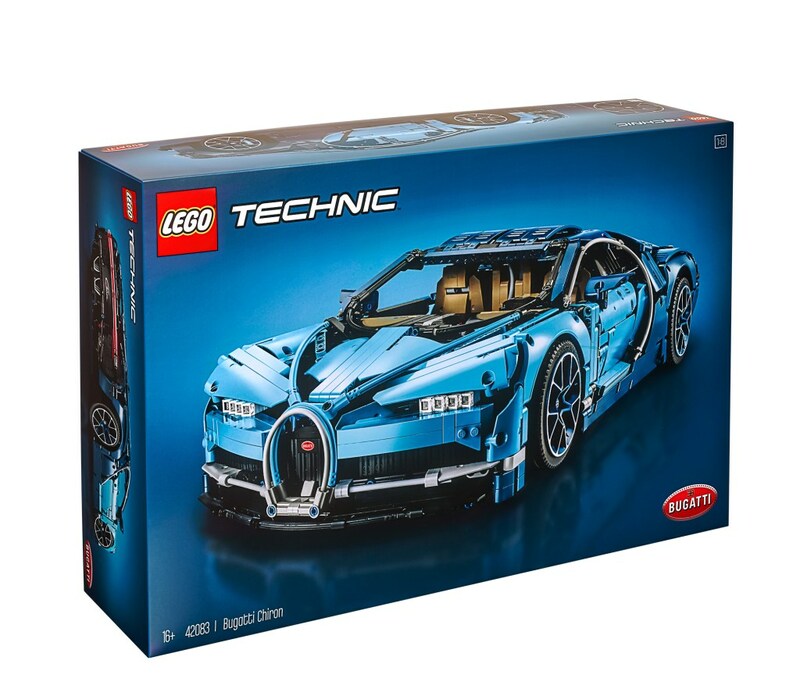 Leviathan’s Bugatti Chiron is very probably the most advanced Lego model we’ll see all year, and if LEGO’s own 42083 Technic Bugatti Chiron set is half as good when it arrives later on this year it’ll definitely be a set worth having. In the meantime you can read full details of Leviathan’s unbelievable creation at the Eurobricks forum, where there are also images showing the amazing engineering within, you can see the full gallery of images on Flickr, and you can watch a video demonstrating all of the model’s incredible functions by clicking here. Andrea Lattanzio (aka Norton74) is becoming a regular at The Lego Car Blog with his beautiful vintage motoring scenes. This wonderful Bugatti Type 35 has appeared here before, pictured being unearthed in an elderly farmer’s barn. This time Andrea takes us back to the when the car (and farmer) were a little younger, with this brilliant historic gas station scene. We’re not sure the Bugatti would be a new car, even in this era, as something much more recent seems to be poking out of the garage, but nevertheless we’re willing to bet that the Type 35 caused a bit of a stir at the Shell Service. There’s more to see of Andrea’s gorgeous build on Flickr – click here to step back in time, or here for today’s title song. It’s every petrolhead’s dream to unearth an amazing classic car, unknown to the world for decades, hidden away in an unopened garage, workshop or barn. It’s TLCB Master MOCer Andrea Lattanzio aka Norton74‘s dream too, so he’s decided to build his very own barn find, depicting the moment a farmer reveals the old Bugatti racing car that’s been sleeping untouched for half a century beside his hay. This particular barn find would be sure to raise some global interest, with Bugatti Type 35 Grand Prix’s fetching around $1.5million at auction. Do you think he’ll sell it? Head over to Andrea’s photostream to ask the farmer really nicely. It wouldn’t be a money themed day without the investment banker’s favourite word; Bonus! So we’ve got a bonus for you in the form of an extra post showing both of today’s builds side-by-side. This is fitting because those ordering a new Bugatti Chiron already own on average over fifty cars each, so it’s highly likely they’ll have an Aston Martin too. Or seven. These shots have been made possible by the fact the the builders of the Chiron and Vantage GT3 are brothers, uploading their creations within a few hours of each other. You can read more about each build by clicking here for the Bugatti Chiron and here for the Aston Martin Vantage GT3, plus you can see more the models together by visiting Lachlan’s Cameron’s Flickr photostream, and we’ll see you tomorrow for something much more humble! The Lego Car Blog is not a money-focussed organisation. We only allow limited advertising, the proceeds of which you can read about here, and the staff all work for nowt (human), or Smarties (elf). However, we are still amongst the richest people on earth, thanks entirely to the place of our birth. And if you’re reading this, you probably are too. But there’s rich, and then there’s rich! Today’s car certainly belongs to the latter. Costing $2,700,000 in base specification, the Chiron is the world’s fastest (when tested) and most powerful production car, expected to hit around 285mph when de-limited. We’ll have to wait to see what top speed the Chiron achieves once testing is complete, as the car (and more importantly, the tyres) are in the realms of experimental physics, but even with the car’s main purpose – top speed – being an unknown statistic, it hasn’t stopped 200 Chiron orders being placed before anyone has driven it. Like we said, there’s rich, then there’s rich! In fact the average Chiron customer already owns over fifty other cars. And a helicopter. We’ll stick with this one then, built by previous bloggee Lachlan Cameron it’s the first Technic Supercar sized Bugatti Chiron we’ve seen, and it is absolutely spectacular. With Bugatti’s trademark W16 engine hooked up to an all-wheel-drive system, independent suspension, full remote control drive, steering and electronically deployable rear wing, LED lighting, and SBrick bluetooth control, Lachlan’s Chiron is one of the finest Technic Supercars of the year. There’s a whole lot more to see of Lachlan’s Bugatti at his Flickr photostream or via Eurobricks, including WIP shots and images of the rolling-chassis mechanics. Click the links above to make the jump, and you can see the Chiron in action via the video below.